​Super Bowl weekend is upon us, and who needs a better excuse to get in the kitchen and do some culinary damage. The first Super Bowl, or Super Bowl I, took place in 1966, and this years Super Bowl XLVI will take place on Sunday February 5th, 2012. The New England Patriots will battle against the New York Giants for the championship of theNational Football League. Super Bowl Sunday has become a great American tradition, founded on pride for the national game, and has become the second largest food consumption day in the U.S. second only to Thanksgiving. The Super Bowl television broadcast is also known for being the most watched television program of the year, bringing in large sums for advertisement, and entertainment. get the professional opinions on the game and players. I don’t have a personal favorite this year but I may be routing for the New York Giants, and Eli Manning for the simple fact that this will solidify Eli’s place as an amazing quarterback with talent that was far underestimated in his early season’s when compared to big brother Peyton. O.k. I know that sounds like I have a favorite but truth is I will be far to busy in the kitchen to really route for either team. My kitchen will be alive on Super Bowl Sunday! Our menu will consist of Bacon- Ranch Blooming Bread, Taco salad bar, seasoned wings, and for the adults the Touchdown Tea (a.k.a. Long Island Iced Tea). And of course no party would be complete without dessert! 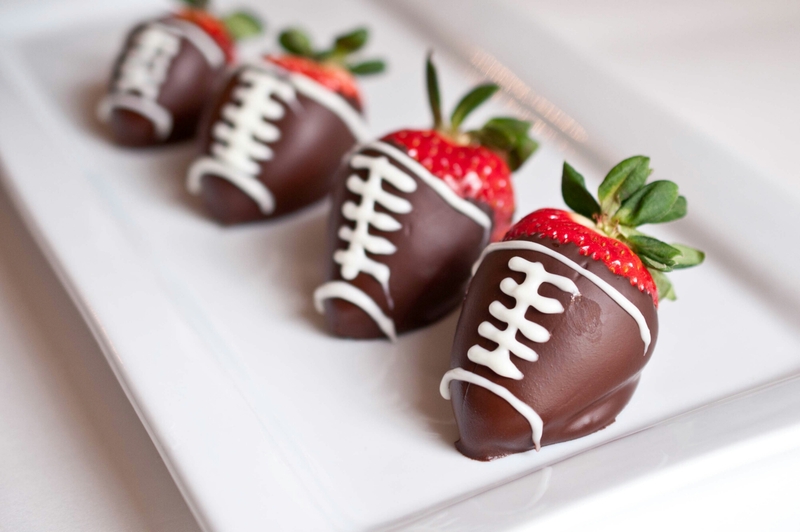 So, I’m preparing chocolate covered strawberries with a football twist, and cupcakes for the kids! I’m not going to share all of these recipes but the fun ones I just have too!! I can’t help myself. Preheat oven to 350 degrees. With a serrated bread knife cut the bread in both directions with out cutting through the bottom crust. Open up the sections of bread and stuff with sliced cheese and chopped bacon, don’t be afraid to stuff it completely full. Melt butter and mix in the ranch dressing seasoning. Pour butter mixture evenly over the bread and wrap completely in Aluminum foil. Place on a baking sheet and bake for 15 minutes in preheated oven. Unwrap and bake and additional 10 minutes until cheese is melted and bread begins to toast lightly. 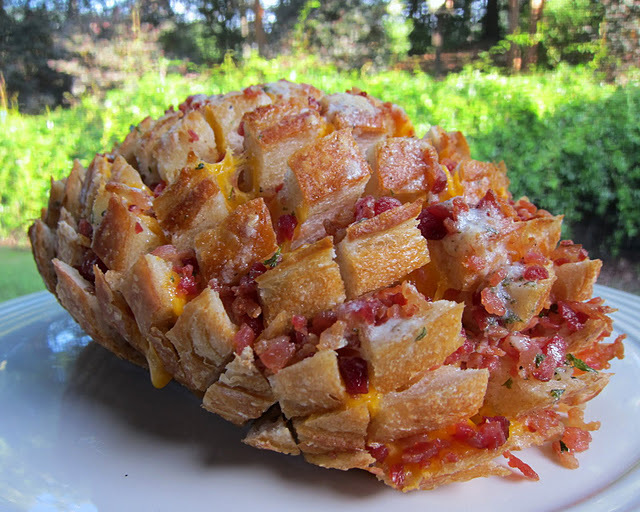 Serve warm, the bread will pull away from the uncut base like a “blooming onion”. Enjoy! Clean and dry strawberries and set aside, heat the chocolate until smooth and dip strawberries covering nearly the entire strawberry. In another bowl heat the white chocolate and pipe onto the cooled strawberries in the shape of football laces. The kids will love this chocolate treat!